Travel back in time with this nod to mid-century modern design classics. Our eye-catching wine rack side table sits on four angled metal legs with a clean lined silhouette. 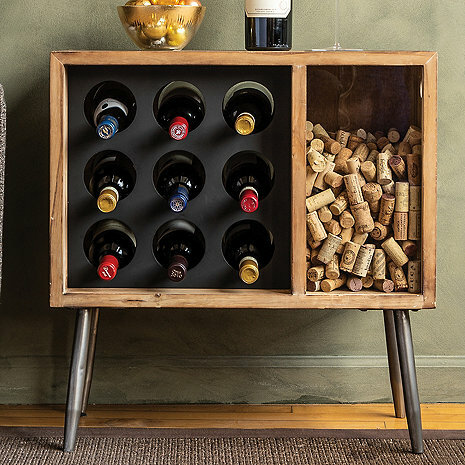 It holds 9 bottles of wine and a few hundred of your most favorite corks, all in a fun vintage television inspired design. Easily add corks on the side of the table. Crafted from solid wood. can it be reversed with the wine on the viewers right? How do you remove the corks? BEST ANSWER: Better yet how do you get them in?